NBC's Luke Russert reports from Capitol Hill where House Speaker John Boehner has been re-elected to his position in the House. Updated 2:14 p.m. -- Ohio Rep. John Boehner, R, won a second term as speaker of the House on Thursday over the dissent of a handful of House conservatives. Following a bruising first two years as speaker and leader of House Republicans, 10 conservative lawmakers cast votes for someone other than Boehner during a roll call vote in the first hours of the new Congress. Several other conservative Republicans abstained from voting. Boehner received 220 votes of a total of 426 cast. While Boehner won re-election to the speakership with the overwhelming support of the GOP, he also narrowly avoided the 16 total defections from fellow Republicans that would have triggered a second ballot of House lawmakers on electing a speaker. That would have been the first time a second ballot was needed since 1923, and a mild embarrassment for Boehner. In remarks after the vote, a characteristically emotional Boehner urged members to resist pursuing "political victory" in lieu of leadership. "If you've come here to see your name in the lights or to pass off political victory as some accomplishment, you've come to the wrong place. The door's right behind you," he said. "If you have come here humbled by the opportunity to serve, if you've come here to be the determined voice of the people, if you've come here to carry the standard of leadership demanded not by our constituents but by the times, then you've come to the right place. " Lawmakers in the House of Representatives convene for the first session of the 113th Congress and re-elect House Speaker John Boehner for a second term. Boehner cited the federal deficit as the overwhelming problem to be addressed by lawmakers, alluding to the need for serious negotiations to solve it. "As Speaker, I pledge to listen and to do all I can to help all of you carry out the oath of office that we are all about to take," he said. "Because in our hearts, we know it's wrong to pass this debt on to our kids and grandkids, now we have to be willing - truly willing - to make this problem right." Washington Rep. Cathy McMorris Rodgers, the No. 4 Republican in the House, said that Republicans’ support for Boehner was “unanimous,” and no other GOP lawmaker publicly nominated an alternative candidate. "There's one person I turn to," she said during her nominating speech, "to help point the way forward." Democrats mostly cast their ballots for House Democratic Leader Nancy Pelosi, Calif., for speaker, though a handful of moderate Democrats defected. In remarks after the vote, Pelosi praised Boehner as a family man and a leader who has won "the respect of his colleagues on both sides of the aisle." Boehner during his two years as speaker oftentimes struggled to manage an unruly Republican conference that threatened to scuttle deals the Ohio Republican had cut with President Barack Obama and Democrats. Boehner led Republicans to the majority in 2010 thanks to an infusion of energy from the Tea Party, but the demands of these conservatives often pushed Boehner into brinksmanship during battles with the administration over funding the government, extending the debt ceiling, extending a payroll tax cut through 2012 and resolving the fiscal cliff. Arm-in-arm with Vice President Joe Biden and Sen. Joe Manchin, D-Ill., Sen. Mark Kirk, R-Ill., makes a dramatic return to Capitol Hill after suffering a stroke, cheered on by his peers as he walks up the steps of the Capitol building. At the beginning of the last Congress, Republicans unanimously acclaimed Boehner as their speaker. But during the intervening two years, Boehner encountered internal challenges that threatened to undercut his leadership. But Cantor received a handful of votes from some conservative and freshman lawmakers during Thursday’s election; one of the other common names was that of former Rep. Allen West, R-Fla., one of the most high-profile conservative firebrands from the last Congress who lost his bid for re-election. The internal Republican discord most strikingly spilled into the public spotlight during the lame-duck Congress, following elections which saw Republicans lose eight seats but retain their majority in the House. Boehner earned enemies from a handful of Republican congressman after the Republican steering committee stripped them of plum committee spots after they were deemed “not team players.” Kansas Rep. Tim Huelskamp, one of the four rogue Republicans, has almost made it a personal mission since then to highlight Boehner’s difficulties with conservatives. Boehner’s speakership also arguably reached its weakest point during the final days of the 112th Congress when his fallback plan in fiscal cliff negotiations – which would have allowed taxes to rise on income over $1 million – was rejected by conservatives, thereby weakening their speaker’s own bargaining position. 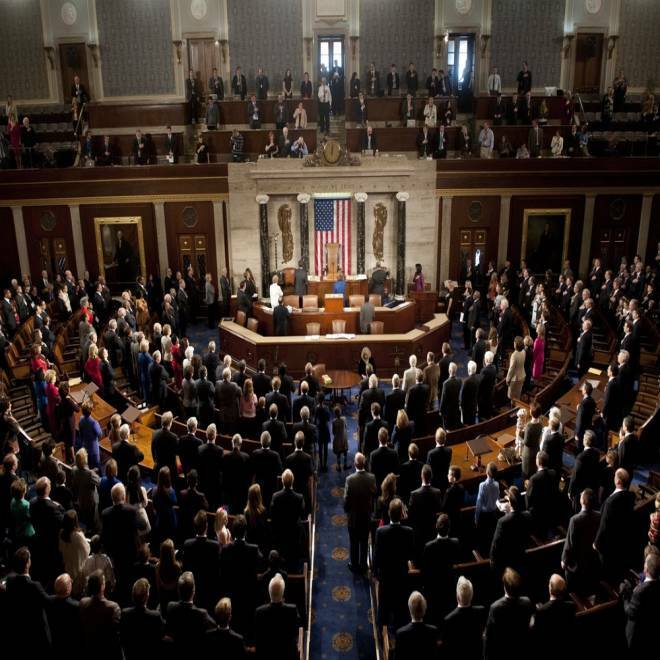 Members of the 113th House of Representatives recite the Pledge of Allegiance during the opening session at the Capitol, on Jan. 3, 2013. But Boehner’s chief advantage in winning a second term as speaker stemmed from his lack of a formidable adversary. Though some grassroots conservatives had sought out different challengers to the speaker, none had emerged as a consensus choice during December. When conservatives floated the name of Rep. Tom Price – Boehner had supported Rep. Cathy McMorris Rodgers, R-Wash., over Price in a race for the GOP’s fourth-ranking position – the Georgia Republican quickly quashed rumors that he would challenge Boehner. And the leaders best-positioned to challenge Boehner – Cantor, Majority Whip Kevin McCarthy, Calif., or even Wisconsin Rep. and former vice presidential nominee Paul Ryan – closed ranks around the speaker, tasking Boehner for another two years with one of the most unenviable tasks in Washington: managing the House Republican Conference. NBC's Mark Murray and Domenico Montanaro discuss the end of the 112th Congress and looking ahead to the 113th Congress.